Adventure #270 (Mar 1960) - The Menace of Aqualad! After a fortune-teller predicts that Aquaman will be replaced, Aqualad is hit on the head and starts acting odd. Glove Color: Yellow, last yellow gloves in Aquaman solo tales. Captured/Knocked Out report: Aqualad is hit on the head by a sinking schooner. Aquaman is entangled in Aqualad's net. Quotefile: Fortune-teller, "Alas! I see great danger for you, Aquaman! Someone new has come into your life who may imperil you... and replace you!" Finny Friends Report: Aquaman and Aqualad are riding whales to the mainland. Aquaman dives into shallow water at an exhibit only to have the whales lift him with their water spouts. Topo alerts the pair to a sinking schooner. Aquaman has eels weave together to form life rafts. Aqualad has squids squirt ink to allow him to get away from Aquaman. 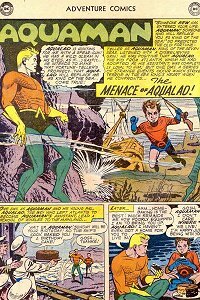 Aqualad sends luminous fish to help Aquaman defeat thieves. Aqualad has luminous fish lighting up the new Aquacave. A parade of fish celebrates Aquaman's birthday. A narwhal, incorrectly identified as a "narwhale", attacks Aquaman as soon as he wakes up and accidently entangles himself in Aqualad's net. It does not respond to his commands, so he thinks it is maddened, but we never learn why. A navy ship intercepts Aquaman in order to present him with a birthday cake, so Aquaman's birthday is known among his surface friends. Aquaman and Aqualad eat the cake while riding on the backs of whales. I love the sneaky look that Fradon puts on Aqualad's face in this story. From the moment the schooner hits Aqualad's head, he changes completely in attitude.